Fluorescence quantum yield measurements are performed to evaluate the emission efficiency of organic EL materials, fluorescent substances for white LEDs, quantum dots, fluorescence probes, etc. With this system, quantum yield can be measured for samples in powder form. The quantum yield measurement unit consists of a 60 φ integrating sphere attachment, powder-sample cell, standard white plate, and quantum yield calculation program. The ﬂuorescence quantum yield can be determined by comparing the molar absorption coefﬁcient, the wave number integration of ﬂuorescence spectra, and the refractive index of the solvent obtained from the absorption spectra of the sample with a standard substance with a known quantum yield. By conducting synchronized scanning with an absorption measurement cell holder mounted on the equipment, it is possible to measure absorption spectra that are immune to the effects of fluorescence. By using this function, we measured the absorption spectra of fluorescein and rhodamine B, and determined their molar light absorption coefficients. Calculating a wave number integration value from fluorescence spectra requires the true spectra in which the effects of wavelength characteristics of the light source or diffraction lattice have been eliminated. 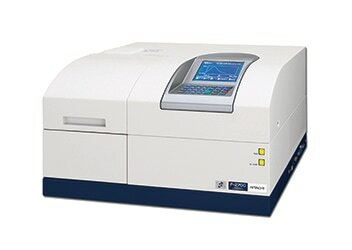 Hitachi fluorescence spectrometers permit applying a correction, based on the rhodamine B method, over a 200-600 nm range based on pre-measured and stored wavelength characteristics of the photometer. Furthermore, in the case of samples that have a fluorescence peak on the long wavelength side, the F-7100/F-7000 can perform 200-800 nm corrections on the fluorescence side by using the photomultiplier R928F as well as a secondary standard light source. Based on the molar absorption coefficient and the wave number integrated value obtained through the above operations, the quantum yield of a sample is calculated.